I fell hard for the passion fruit caramel combination the first time I tasted it in a sauce I drizzled over a burnt sugar cake. The only problem was that it was so good that it outshone the (very good) cake. I was seriously tempted to ditch the cake and drink the sauce. The bright, tropical passion fruit is balanced by the deep, sweet caramel and the one-two punch is outrageously good. While I love passion fruit in tarts and popsicles and pâtes de fruits, and I might take passion fruit as my favorite flavor even over chocolate, I find that the addition of caramel–especially one that gets deeply caramelized to bring in layers of flavor with just a hint of bitterness–takes it over the top. I needed to find a way to highlight the tart, rich passion fruit caramel flavor on its own in a way that wouldn’t send me into a sugar coma. 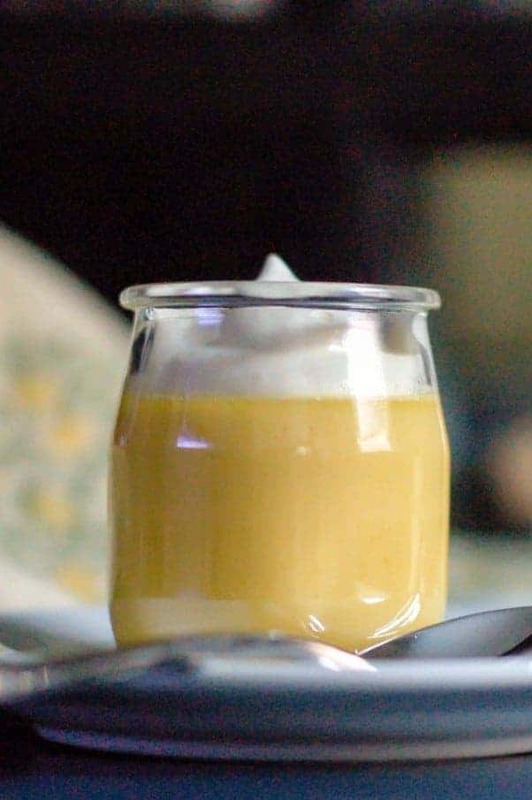 When I hosted a birthday dinner party for a gluten-free friend who loves bright flavors like passion fruit, I had the inspiration to make it into lush, creamy pot de crème, where the sweetness would be rounded out by the eggs and milk fat. 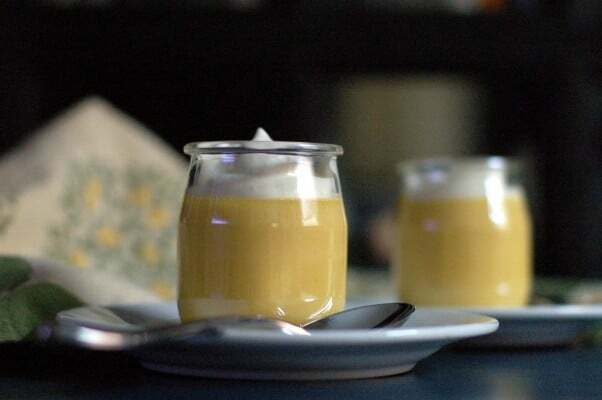 Pots de crème are basically custards that get baked in a water bath. They’re dense and creamy and looser than flan or crème caramel–they aren’t stiff enough to stand up on their own–so they have to be served in the vessels (or pots) they’re baked in. I couldn’t be happier with the results. 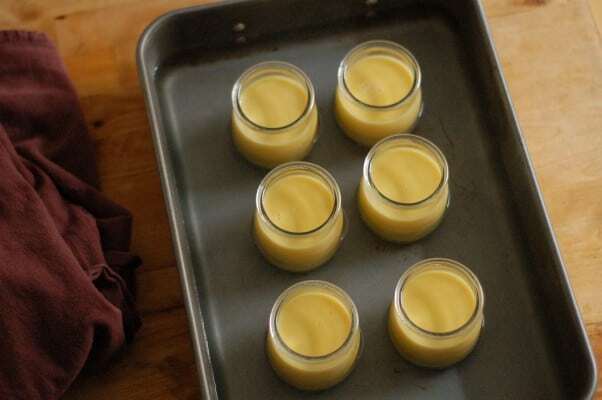 These little pots of sunny yellow cream are sweet and tart and surprisingly complex. Pretty much everything I look for in a dessert. They are rich, so I like to serve them in tiny pots. 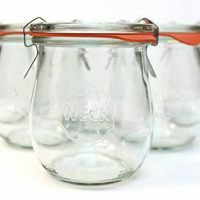 (The ones pictured are glass yogurt containers saved from a local dairy [these are similar], but any little jar or ramekin will do nicely). I like to serve them with a little whipped cream, which has an airy lightness that contrasts with the density of the custard below. They are lovely with a crisp ginger cookie alongside them, or even a thin chocolate wafer cookie (chocolate and passion fruit are a classic combination), but they definitely don’t need anything to hold up as a special dessert all on their own. This is a keeper. The kind of thing to bookmark or print and laminate and make again and again. 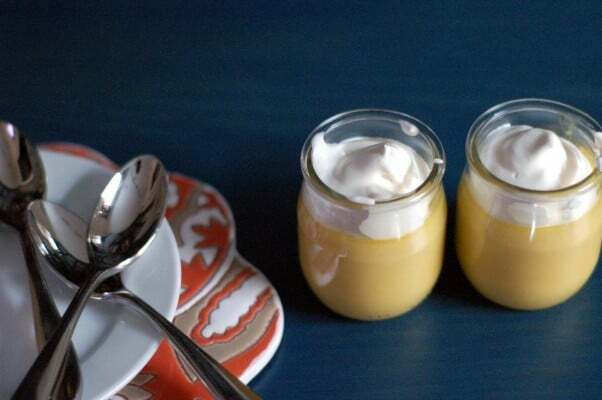 Pots de creme are wonderfully rich and silky custards that are baked in a water bath. They aren’t difficult, but making caramel requires some close attention because it can go from done to a burnt blackened mess very quickly. You can find frozen passion fruit puree in most Mexican grocery stores. I use Goya brand, but anything that is pure passion fruit pulp or puree is fine. 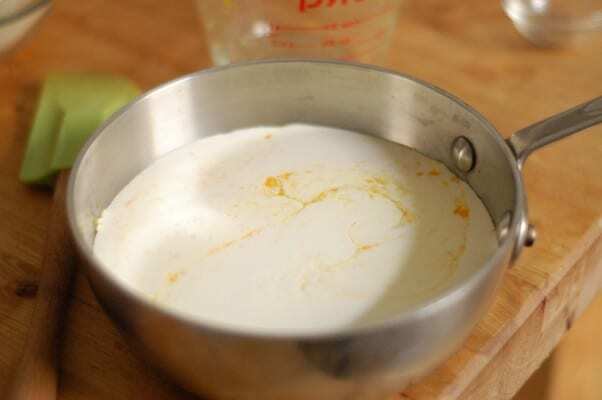 In a small saucepan, combine heavy cream, passion fruit puree and salt and bring to a simmer. Remove from heat. Combine water and sugar in a heavy bottomed medium sauce pan and stir over low heat until sugar is dissolved. 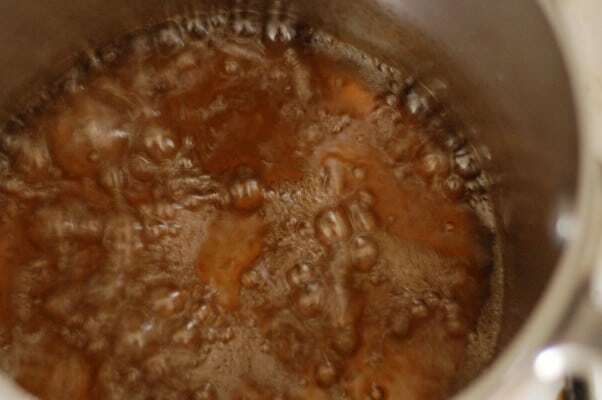 Increase heat to medium-high, bring to a boil, and cook, stirring occasionally, until deep amber, about 5-6 minutes. 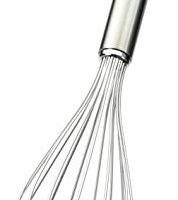 Remove from heat and gradually whisk in cream and passion fruit mixture (the mixture will bubble up vigorously). 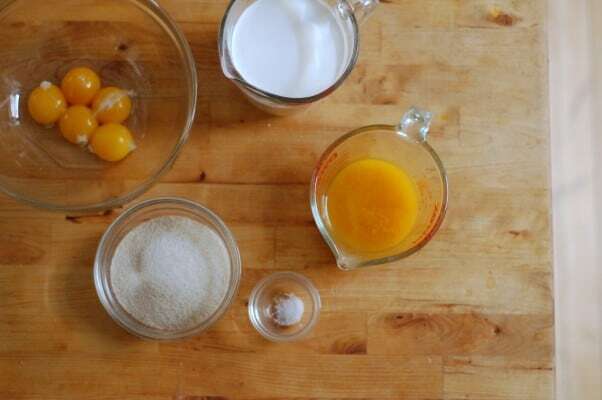 Whisk the egg yolks in a large heat proof bowl, then gradually add the hot mixture and whisk until combined. 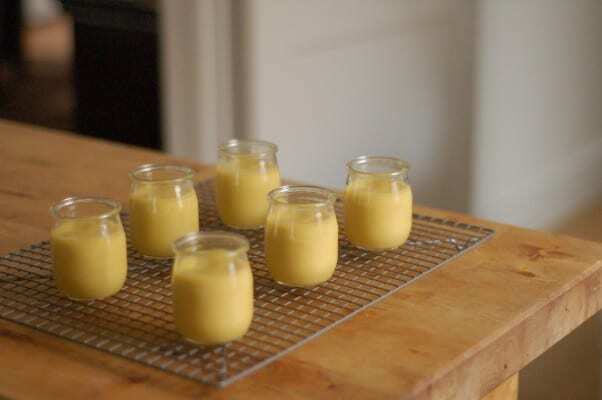 Pour custard through a fine mesh sieve or chinois into a 4-cup (or larger) glass measuring cup. 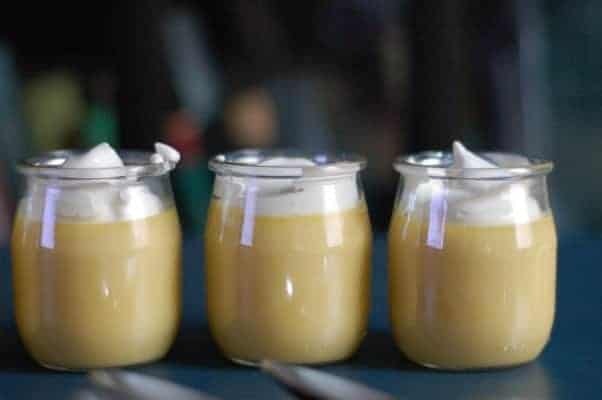 Divide custard among 6 (4-ounce) ramekins or jars. Arrange in a large roasting pan, and pour enough hot water to come halfway up the sides of the ramekins/jars. Cover loosely with foil. 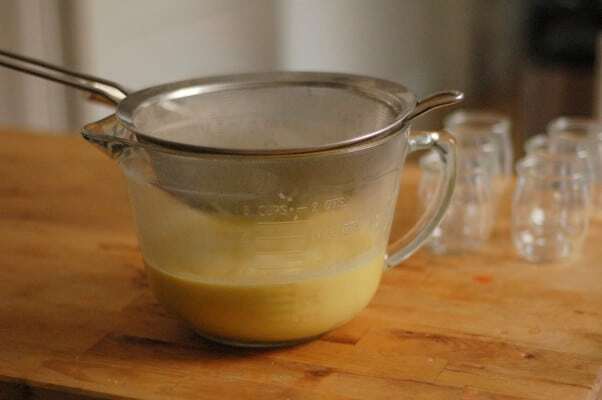 Bake until the custards are set around the edges but tremble slightly when shaken, about 55-60 minutes. 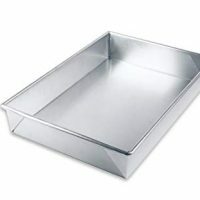 Carefully remove from roasting pan with tongs and let cool to room temperature. Refrigerate for a few hours, until cold. Serve with whipped cream. Best the day they are made, but can be kept, covered in the refrigerator for up to two days. These looks so good, love those cute little “pots” too! Thanks, Sara! I love these jars too (they were originally yogurt jars from a local dairy–but I had to save them for desserts like this).